Bryan White donates to locals in Mityana district. Courtesy photo. A few months ago, Uganda got a new socialite who gained fame after giving out money to the poor worth millions and he is called Bryan White but it seems like he is not yet out of cash as some people claim. 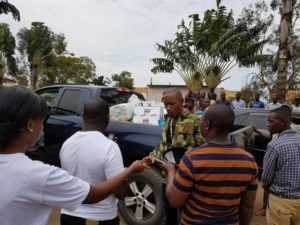 The new don’s helping hand yesterday afternoon extended to Mityana as the money man together with his entire crew under “Bryan White Foundation” drove to the periphery district with two cars fully packed with property worth millions to be given out to the poor people and patients in Mityana hospital. Bryan White is one person well known for always giving out stuff while in front of the camera and even this time around he did not leave the cameras behind as he had to show off what exactly he was giving out. “Heading to mityana hospital for my usual charity work. Bryan white foundation,” he said. 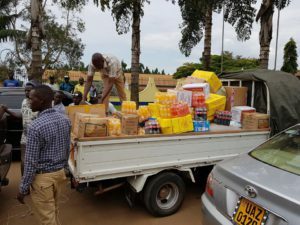 Some of the items that Socialite Bryan White delivered for the needy and the sick in Mityana district. Courtesy photo.